Karma Moffett has developed, over a period of thirty five years, an exceptional program of music, which is presented to the community as a Wish-Bestowing Ceremony. 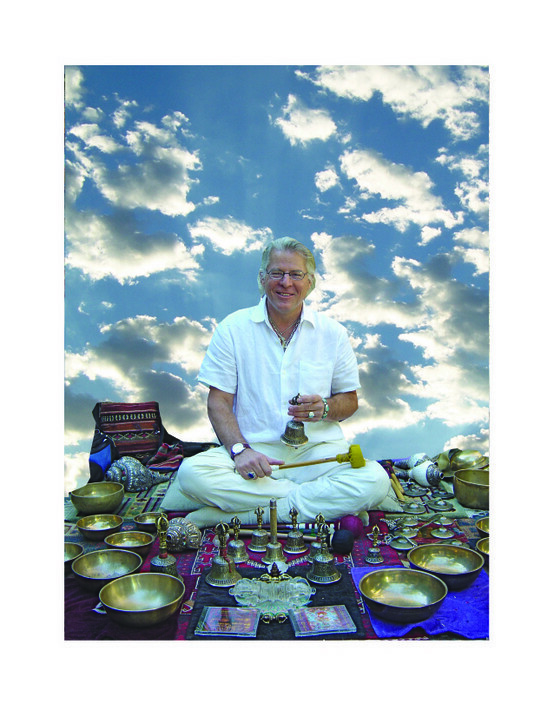 He uses his unique collection of instruments, featuring antique Tibetan Bowls, Bells, Tingsha, Longhorn, and Conch Shells. He also plays instruments gathered from throughout the world, and some he has hand-made. Patterning the ceremony as a symbolic journey to Tibet, Karma begins by playing Native American Flute, to fly the audience to the Tibetan Plateau. 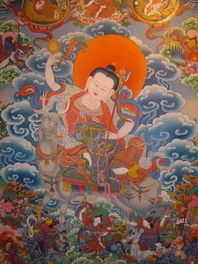 Then Karma plays the Tibetan Longhorn, escorting his audience into the monastery. There follows a journey through the Bowls, from the low tones to the high, using varying patterns, creating different harmonics amongst the attuned and paired sets of bowls. Next resound the higher notes of the Bells. The journey upwards culminates in the highest-pitched tones of the Tingsha and the Conch Shells resonating above. Gently, Karma reverses the pattern, back downward through the Bells and Bowls. At the end, he dissolves the movement of sound into the stillness of the Great Mystery. This entire process takes about eighty minutes. There is another aspect to the ceremony. It is becoming widely accepted that pure sound tones and harmonics have a positive and penetrating impact upon a person's natural healing system. Karma has developed his collection of instruments and his ceremony with this understanding as his guide. When experiencing the ceremony in an intimate setting, one really feels the Longhorn and the Bowls move the energy of the lower chakras. The Bells move the heart and middle chakras. The Tingsha and Conch Shells stimulate the crown and higher chakras. Thus, the journey to the highlands is also a journey through the chakras. One of the outstanding qualities of Karma's Bell Set is its harmonic attunement. Karma has sifted through nearly five-thousand bowls over a period of thirty-five years to accumulate twenty bowls. These were selected for their purity and clarity of sound, sustained resonance, and harmonic blending or pairing with the other bowls within the set. The bowls, are handmade, using from five through seven metals. The Tinsha Cymbals are made of Black Metal, (twelve alloys including meteorite). The varying thickness of the metals produces a variety of tones and harmonics, within each bowl. When the bowls are played in runs or struck as pairs, their harmonics penetrate the physical and subtle bodies of the listeners. The audience easily relaxes into a natural state of meditation. Karma's mastery of circular breathing, which he applies to the Longhorn, Native American Flute, and Conch Shells, allows him to bring the pure tones of each instrument to the listener in an unbroken stream of sound for twenty or more minuets. When he plays the Longhorn at fairs and expos, people are drawn from all corners of the grounds, as metal is drawn to the magnet, to experience the power and variety of tones, which Karma achieves. In an enclosed setting, the sound is even more remarkable. Karma plays background music for celebrations, birthdays, weddings, Yoga, massage, births, and rites of passage. He's been invited to play for the Kalachakra Mandala installation at the Asian Art Museum in San Francisco, as background for a Tibetan exhibit in the Crocker Museum in Georgia, as background for meditations, whole life expos, and numerous benefits. And, his music is extensively used as background for meditation, yoga, t'ai chi, massage, and births. printer and would bring home boxes of paper left over from paper cutting. driving race cars and would sell them in school for 50 cents. Vietnam and given the job as an illustrator for propaganda. portrait artist in Malls and Boardwalks. in coffee shops throughout the city. surreal images which he felt connected him to a spiritual self. Water Color, & Oil Painting. He also worked in Wood, Silver, Copper, Glass, & Bronze. He is a father of four and delivered his first three children. viewer can empty ones mind while meditating on the image. of essence on the viewer.